Few of those on the seventh floor of Spokane City Hall had as much experience with the city as legislative assistant Richard Rush. He served for four years as a city councilman — with current Councilwoman Lori Kinnear serving as his legislative assistant. He nearly won a second term; in 2011, he lost to Mike Allen by a mere 88 votes. But two years later, he returned to City Hall, hired on as a council assistant for newly elected Councilwoman Candace Mumm. That all ended on March 31 when Mumm fired him. Mumm says she had already been planning on finding another assistant. But HR concerns raised in March sparked more immediate action. At a March 14 city council meeting, City Council President Ben Stuckart says, a woman approached him with concerns about her interactions with Rush. "Some people don’t have good boundaries," Stuckart says. "Some people when they ask people out on dates, and they’re told no, ask them a second time. And then sometimes they ask them a third time to go on a date, and that makes people feel uncomfortable." This was one of those cases, Stuckart says. Immediately, he says, he turned to Brian McClatchey, the council's legal advisor, and discussed how to proceed. The next morning, Stuckart contacted the city's Human Resources department and asked them how they'd handled it. By March 16, Stuckart and HR director Heather Lowe met with the complainant to discuss her concerns. Stuckart says the conclusion — from HR and the city's legal department — was that Rush's conduct didn't constitute any kind of harassment. No laws or city policies were violated. "There was no inappropriate touching, there was no inappropriate trying-to-kiss-somebody," Stuckart says. "It was off-site, it was a citizen event, it wasn’t a city event." "I did not get a lot of details," Mumm says of the concerns raised by Lowe. But she says that didn't matter — she'd already made the decision to fire Rush and hire another assistant. The original agreement between her and Rush had him serving only a year, and they were going on two years. "This accelerated the process," Mumm says. "I had HR draft a letter which would have him no longer working after he returned from vacation. I met with him, and told him that his services were no longer needed." As an at-will employee, Rush could be fired by Mumm for any reason. Rush knew that. "I don’t think I was mistreated in any way by Ben or Candace," Rush says. Rush says, however, that Mumm hadn't given him any explanation for his firing. He says the firing felt like it came "out of the blue." He says he didn't learn about concerns from HR until mid-April, after he'd been fired, when Lowe wrote him a letter. "[Lowe wrote] there were two city employees who had said not to bug them or not to call them," Rush says. "I could continue to interact with the city as a citizen, but I could not call any city employees on their work time." In his reply to Lowe, Rush says, he denied the suggestion that anything improper had occurred, and wrote that if Lowe continued to contact him about those "false allegations" he would seek legal counsel. He says his interactions with the employees named in the letter have been minimal, and nothing remotely inappropriate had occurred. "My relationships with them were cordial and civil and quite frankly, I never heard the word 'stop,' 'no,' 'back off,' none of that," Rush says. "One of those people I’ve seen once, or maybe three times in passing. We’re talking people I had just met; they’re acquaintances." Stuckart feels that the council handled the concerns about Rush much better than the city administration handled the more serious allegations against former police chief Frank Straub. "This is all unfortunate for Richard. It’s unfortunate for the citizens who were made to feel uncomfortable. But I think we handled it correctly by asking HR to investigate," Stuckart says. "Candace and I handled the situation pretty damn well, I think." Stuckart says he didn't announce Rush's termination to the press because the investigation had not revealed Rush had violated city policy and because he was fired as an at-will employee. But lately, rumors have been swirling about Rush, thanks in part to an email about Rush sent out by Lowe to several Spokane city department heads. "I thought it was inappropriate and shouldn’t have been sent out," Stuckart says. City spokesman Brian Coddington confirmed that such an email had been sent on April 11, but declined to provide the Inlander with a copy, explaining we would have to wait for a records request to reveal it. Asked why the email was sent, Coddington says it would be "self-explanatory" once we read it. Stuckart, however, has his own theory. "I think once someone gets fired and you’re in the middle of an election season things get political," says Stuckart, who notes he wasn't sent the email. Rush echoes that politics may have played a part. "In the world of politics, you have to look into deeper motives and what’s going on. The target of the complaint never knows about it or hears about it, and they can’t make a defense?" Rush says. "Well, that’s f—-in’ convenient, excuse my language." Rush faced a similar controversy back when he was still a city council member. Former County Commissioner Todd Mielke says the director of the Spokane Regional Transportation Council approached him with concerns about Rush's interactions with a female employee. "I was aware that a female staff member was uncomfortable with the amount of time that he was spending contacting her around the office — and the nature of his invitations to do things on weekends and after hours, that she was not interested in pursuing," Mielke says. "She was not comfortable making a formal complaint, and just wanted the activity to stop." Rush was still married back then, and Mielke suggests that invitations to colleagues for dinner, for example, could have been interpreted in different ways than Rush intended. Both Mumm and Stuckart say they hadn't ever heard of those concerns until recently. "This is the first I’ve heard that kind of information," Mumm says. "I wish I would have known that." Rush, for his part, says he was familiar with the old controversy, but speculates it was politically motivated. "Everybody that’s in politics, anybody can say anything they want to about them and can do so with precious little evidence," Rush says. "You take a basic truth that I know somebody, or that we’ve had lunch together or done something like that — I've had coffee, I’ve corresponded with them — you can gin that up into a larger story pretty fast." 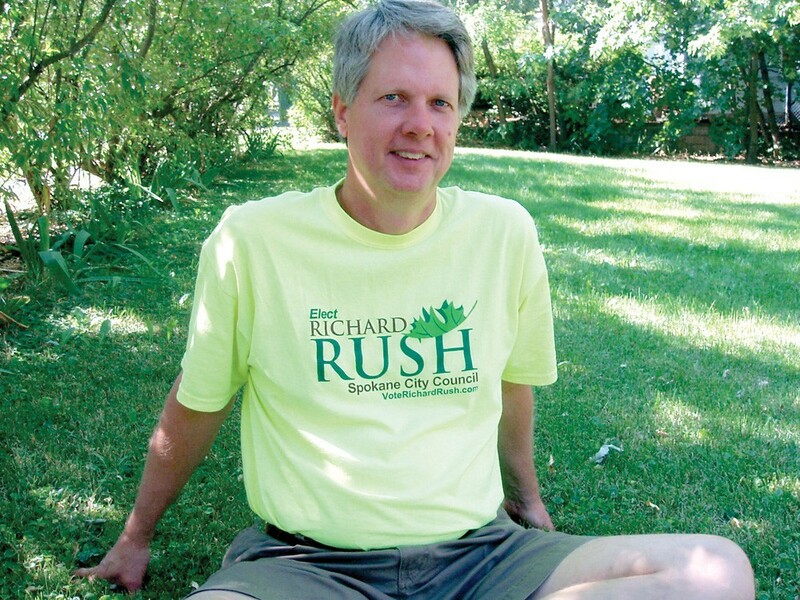 Richard Rush is trying to keep his seat and his sway. Mike Allen just wants to get back on the Council.